Loki is my 12 pound American Chinchilla Rabbit. He's an adorable little guy who one of my dear friends named "The Lettuce Ninja" after she had to watch him while I was on vacation. I had rabbits when I was a kid. I did not know how to care for rabbits back then, and was a poor pet owner of them. Rabbits, for how common they are, are exotic pets when compared to dogs or cats. 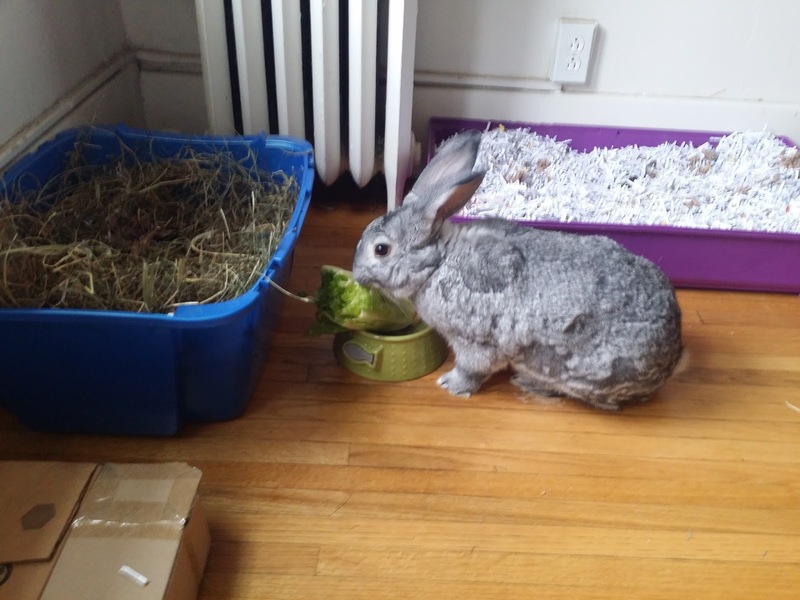 Loki is fed a mixture of standard animal-specific pet food, green and leafy vegetables, and Timothy Hay. The hay is the biggest stumbling block that I deal with in taking care of him; it can be very expensive. When I first adopted him, we bought hay from local small pet stores, national brands that gave me three pounds of hay for ten dollars. It was gone, every single time, every single week. After that, I went to a local farm supply store, and I bought a bale of hay. It cost $6, and it gave me hay for almost a year. But the hay bales from them is somewhat dried out, so I'm currently getting it from Small Pet Select. It's more expensive, but the hay fills the wire cart that I've turned into a hay hopper for the hopper. He's got free access to as much hay as he wants to eat. Note if you ever think about getting rabbits: They need to eat primarily hay! This is the biggest mistake I made as a young rabbit owner, not understanding this fact. Loki's too big to live in any cage that could fit in a one bedroom apartment, so he's a house bunny. I got him from the local humane society litter-trained, so aside from a fondness for wires (and I've had cats that did too), his care is a little like a cat's: feed him small portions, keep an eye on the water, and clean the little box. And it's worth it. Isn't he adorable? Cars, I've had a few.